From the Baldwin County Courthouse, go east on Hancock St. one block. Turn right (south) on Wayne St. Go straight on Wayne St. for one mile. Jog left onto Vinson Highway. Continue on Vinson Highway (Hwy 112) for 1.8 miles to the park on the right side of the road. Park and walk into the park to the monument commemorating the 2000 African Americans originally buried here. Then continue past the monument up the hill to the cemetery. The cemetery is 0.2 mile from the parking lot. 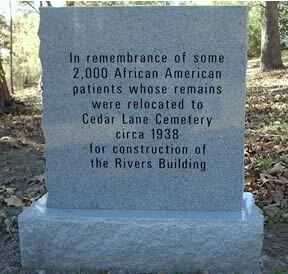 2000 people were disinterred from this cemetery in 1938 and moved to the Central State Hospital's Cedar Lane Cemetery - African American section. 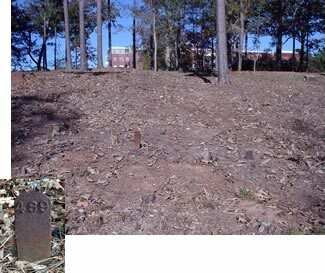 An unknown number of graves, several are marked with iron numbered markers.